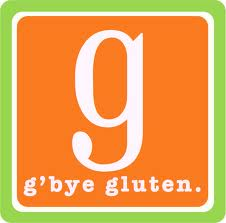 For years now the word gluten has been a daily part of my daily vocabulary. When I first heard it muttered by my doctor six years ago, I imagined it as this long, drawn out and terribly blah-sounding word. Since I say it so regularly now, I’m a bit immune to the heavy and unappealing sound of it. And now that it’s become a part of our daily vocabulary (pretty much world-wide), the awareness of a gluten allergy and sensitivity has risen, along with the danger of it not being taken seriously, since it’s often perceived as a fad. Why the fad? Several reasons, really. Celebrities and public figures are claiming it to be a great way to ‘cleanse’ the body, and lose weight. And there’s the growing popularity of Primal and Paleo diets, which shun gluten for it’s lack of nutritional benefits, and it’s negative effects on the body, regardless of an allergy or sensitivity to it. All of which is true by the way. And products from soda water to maple syrup labeling themselves as gluten-free. So again, not that I think any of this is bad on it’s own; we’ve created a movement, an awareness of the importance of eating healthy, whole foods and of how key nutrition is to your overall health. But it’s also created a mindset that everyone is going gluten-free because it’s the latest and greatest diet fad. Try it, you’ll lose weight and feel great… which is probably true, but not helpful to those of us who truly suffer from an immune repose when we eat it. Several years ago, I would talk to a restaurant employee who would take it very seriously, never asking whether it was a personal choice or an allergy. They would usually send the manager over to the table, who would discuss my options with me and educate me on how the kitchen handles food so I was aware of any potential cross-contamination issues. I could then make an educated decision based on what’s best for my health. Fast forward to today, when ‘gluten-free’ is the rage, and restaurants are handing out gluten-free menus and the staff is often-times unaware of the severity behind the issue. In fact, recently while at a popular local chain here in Austin, I was told they no longer offer a gluten-free menu because they realized that using the same fryer for breaded items, and claiming to be gluten-free, wasn’t OK. If you think about it, some of the breading from the foods fried stays in the fryer, and attaches to the non breaded foods being fried next. So even though the foods they were calling gluten-free weren’t breaded, they were still mingling with plenty of residual breading left behind. Dangerous for those of us who need to only ingest a small amount of gluten to have an allergic reaction. And by the way, did you know that US law allows for something to be labeled gluten-free if it contains less than 20 parts per million (PPM)? That means there may be slight amounts of gluten in the foods you’re eating, and assuming are OK. I was recently talking to someone who was complaining that she went gluten-free, but she’s still having migraines, fatigue, body aches and brain fog and couldn’t figure out why. When I explained that the replacement foods she’s eating are allowed to have trace amounts of gluten in them she was angry. Can’t say that I blame her. To be clear, I’m grateful for the USDA’s movement to properly address a very serious health condition, and try to help us avoid foods that we’re allergic to, but I do wish they would realize that even the smallest amount of gluten, for some of us, can cause an allergic reaction. There are so many factors at play here, that I typically recommend someone just starting to eliminate gluten avoid replacement foods all together, so they can allow their body to truly heal. Once healed, they may be better able to handle the little bits of gluten from cross contamination or reduced PPM here and there. I know there’s some confusion on what gluten actually does to the body, and why it seems like this is such a big thing now. I’ve heard it called a “rich person’s disease” and honesty, I get it. It does seem like its everywhere these days. There’s a lot of talk online about why the rates of allergies have risen so dramatically since we started manipulating our food supply, and why we can’t handle eating foods we’ve eaten for generations. If you want to learn more, simply follow Robin O’brien for what I deem the most non-biased, grass-roots effort to help stop the contamination of our foods and require labelling of GMOs. She helps us understand why we’re suddenly seeing so many more cases of gluten sensitivities and Celiac disease. And by following her I’ve been able to piece together a few key points in my life. The first is that I was always sick. I never really felt good, and my mom was taking me to doctors as young as 8 to help figure out what was wrong. I had chronic migraines, fatigue, social anxiety, weight fluctuations and more. I also had terrible gastric issues, which they labelled as IBS when I was 10. I now understand issues that my grandmother and great-grandmother had as well. They’re Italian, and so I grew up eating pasta and bread. With every meal. No wonder I was sick all the time. As I grew up, I realized that my friends and family were directly affected by my poor health and weakened immune system. I struggled through my teens and twenties with relationships that were affected by my fatigue and mood swings. And it’s nearly impossible to imagine explaining to a date why you have to spend 20 minutes in the bathroom after you eat. I went on a lot of first dates that were never followed by a second one. Not like I didn’t understand why, but it was definitely frustrating. Last year I wrote about Jennifer Esposito being fired from CBS’ Blue Bloods. She collapsed due to health complications from Celiac Disease, and was fired. For those of us who have it, we get it. It’s not a fad, it’s not a trend – it’s a serious, life threatening condition that can lead to some pretty heavy things that we’d rather not think about. When did we all get so picky, she asks? As if having a gluten allergy is something we choose. So while it’s great to have so much awareness tied into gluten allergies, we have to be even more diligent with our health thanks to the belief that it’s the latest craze. And while I love that some people are using their public voice to raise awareness to our cause, I cringe when I see it being presented as an opportunity to simply replace all your former gluten-full goodies with gluten-free ones. Here’s one of the bigger culprits of that – Elizabeth Hasselback on the View, sharing her experience with going gluten-free after a Celiac diagnosis. Watch her broadly sweeping her arm across a table filled with some of the many gluten-free products that are on the market. She smiles and chirps her way through the segment declaring how these gluten-free products have made going gluten-free a tasty breeze. I’m thrilled that Elizabeth Hasselback might be able to indulge in gluten-free cookies, pretzels, cakes and more without a reaction. But myself, and plenty of gluten-sensitive folks that I know, aren’t so lucky. Cross reactive foods – that’s when your body can’t tell the difference between gluten and the most commonly used items in gluten-free foods such as tapioca, quinoa, millet, sorghum, potato and more. We eat them – we react just as if we ate gluten. Cross Contamination – since many of these products labeled gluten-free are processed on equipment that processes wheat, the chances of cross-contamination are high, making it potentially just as bad for you to eat if you’re allergic/sensitive as an actual gluten-full food. And let’s not forget that many of the gluten-free products out there are filled with sugar, and are truly no better for us than their gluten-full processed counterparts. USDA Labelling laws: by law, a product is allowed to have trace amount s of gluten in it, and still be labelled as gluten-free. 20 parts per million, to be exact. Beauty products – these guys are often times unsafe, having wheat and/or a by-product of gluten in their ingredients. Remember that most of what you put on your body, goes into your body, so the safest bet is to focus on products that are labelled gluten-free. Remember, double check the ingredients as well and watch for the most common hidden ingredients list. So the lesson here is buyer beware. Be cautious of a gluten-free label. Get to know your local restaurants. Check with the local Gluten Intolerance Group in your area and find out which restaurants are certified as gluten-free safe. You can also see a list here, though I haven’t updated in a while so it may be missing some of their latest updates. Be mindful, be careful and be your own advocate. Don’t assume that just because something is labeled gluten-free, that it is. Eat clean, prep your own food as much as possible and don’t be afraid to ask questions. Only then can you truly protect your health. Here’s a Gluten free deal to take advantage of, and on behalf of products we love too! 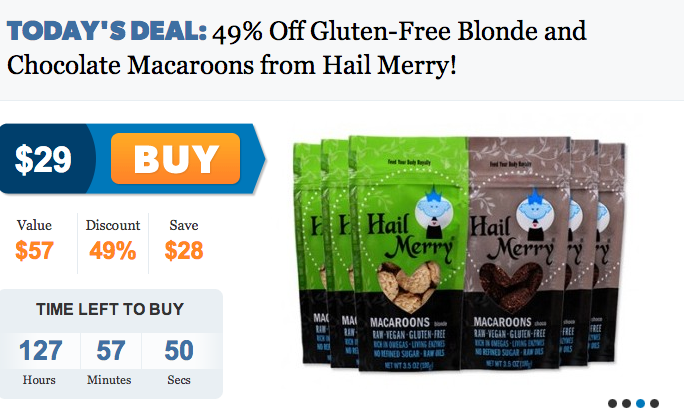 Enjoy an almost 50% savings off Hail Merry’s Macaroons (these little guys are fave around here and a sure fire way to satisfy your sweet cravings without totally reversing all the good you’ve done on a healthy eating path). They’re RAW, Gluten Free and Low Glycemic – woot! Limit 1 deal per customer. Valid for residents in all 50 states. Cannot be combined with any other promotions from Hail Merry. This is an exclusive voucherless deal, so you can sit back and relax while your Hail Merry macaroons are shipped directly to your door! All orders will be shipped 3 business days after purchased.